Addressing the importance of constructing and understanding mathematical proofs, this book introduces key concepts from logic and set theory as well as the fundamental definitions of algebra to prepare readers for further study in the field of mathematics. The author supplies a seamless, hands-on presentation of number systems, utilizing key elements of logic and set theory and encouraging readers to abide by the fundamental rule that you are not allowed to use any results that you have not proved yet. The book begins with a focus on the elements of logic used in everyday mathematical language, exposing readers to standard proof methods and Russell's Paradox. 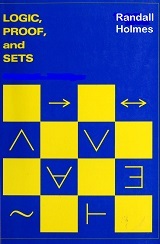 Once this foundation is established, subsequent chapters explore more rigorous mathematical exposition that outlines the requisite elements of Zermelo-Fraenkel set theory and constructs the natural numbers and integers as well as rational, real, and complex numbers in a rigorous, yet accessible manner. Abstraction is introduced as a tool, and special focus is dedicated to concrete, accessible applications, such as public key encryption, that are made possible by abstract ideas. The book concludes with a self-contained proof of Abel's Theorem and an investigation of deeper set theory by introducing the Axiom of Choice, ordinal numbers, and cardinal numbers. This is an excellent book for mathematics courses on proofs, logic, and set theory at the upper-undergraduate level as well as a supplement for transition courses that prepare students for the rigorous mathematical reasoning of advanced calculus, real analysis, and modern algebra. The book is also a suitable reference for professionals in all areas of mathematics education who are interested in mathematical proofs and the foundation upon which all mathematics is built. M. Randall Holmes is a professor of mathematics at Boise State University.